Vince Poscente states, "If you truly want to align your team to sustained greatness, teach them how to Do What the Competition is Not Willing to Do. Every human being on the planet will make a decision about the path or direction they choose when they have an emotional buzz to urgency and they will take action. An an emotional connection to the urgency is life changing." Have a year long incentive plan. Challenge them to reach a team goal. Use team building to generate the 'foxhole' mentality. But what most leaders do not realize is the value of an artfully delivered experience of how to Do What the Competition is Not Willing to Do. In our world, that is a team building keynote presentation by Vince Poscente. If you have not experienced Vince Poscente's 60 minute keynote designed to align employees, then you are likely skeptical. If you have been in Vince Poscente's audience for a motivational keynote then you know it is unforgettable. His technique for speaking centers on the impact an outside perspective can have. He brings professional adults into a roller coaster ride of key emotional drivers (humor, sadness, regret, joy, satisfaction and ambition). Vince Poscente crafts a message tailored to the needs of your audience. He uses music, audience engagement and video to hit a deep nerve. Quite simply he brings them to a moment of emotional intensity where they decide, in a heartbeat, on a path towards team synergy. Leaders can be like parents with teenagers. It takes an outside voice to get through at times. 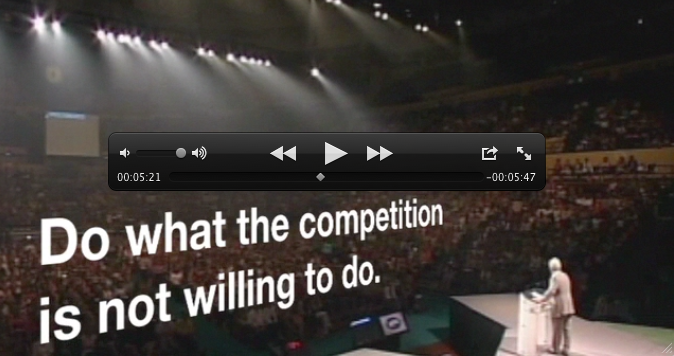 The value of a delivering a "path changing" keynote is an investment in organizational growth. At your next meeting use Vince Poscente's approach to the "Urgent Why" to instantly engage your audience with lasting impact. A list of our clients dedicated to aligned teams, strategic leadership and accelerated productivity.